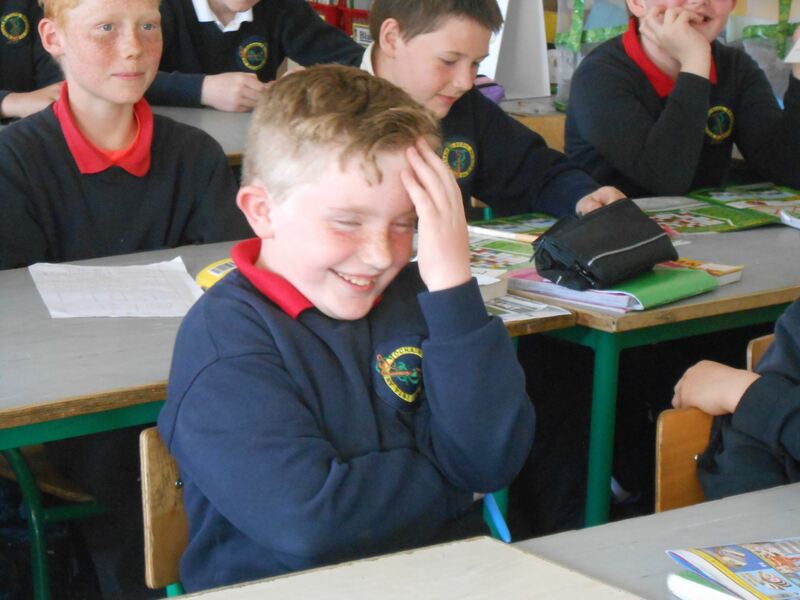 Fis films » TOGHER N.S. We had a great day at the Cinemax Bantry to watch our film – “Technical Difficulties” and films from all over West Cork as part of the West Cork Education Centre Film Festival. We were delighted to win the Best Film Editing Award. 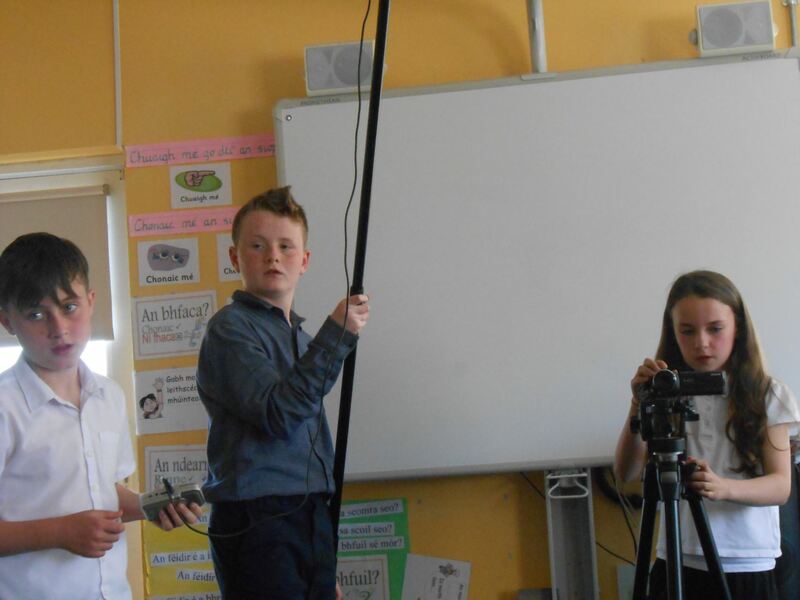 The children have written the script for their Fís Film and filming has begun.The FÍS Film Project is a wonderful example of a project that encourages creativity and imagination among children and their teachers in Irish primary schools. FÍS explores film as a medium of expression in relation to the arts, and introduces children to aspects of the film-making process . 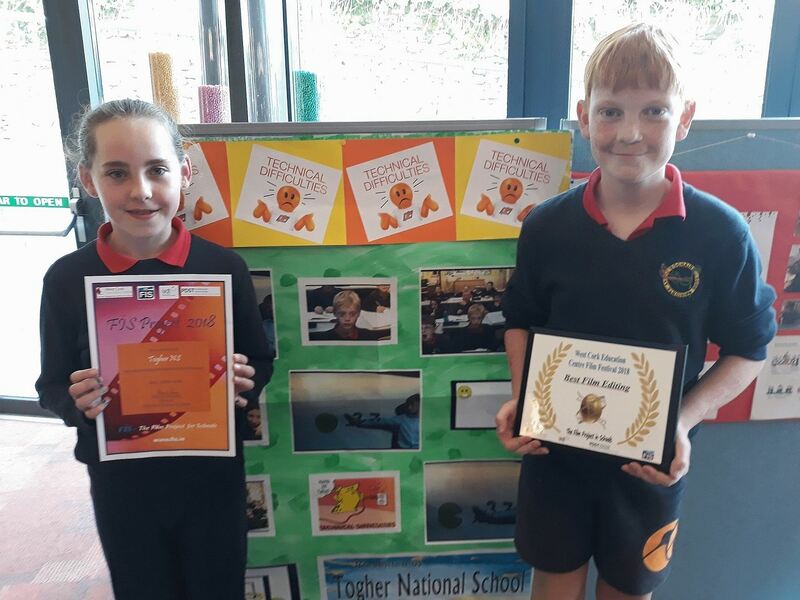 The project culminates each year in the annual FÍS Film Festival where 25 films are shortlisted for awards in what is essentially an “Oscars” ceremony for Irish schoolchildren. Many thanks to Victor from the S.C.P. for all his help with our short film. 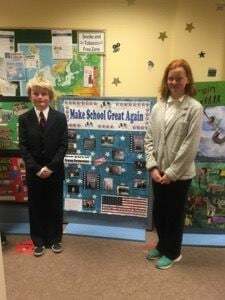 This year our film for our Film in School project is called “Make School Great Again!”. It involves President Trump, Togher Castle and school! 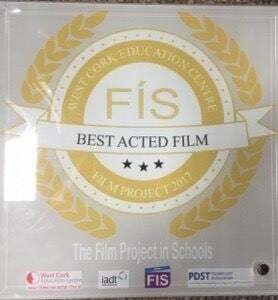 It won an award for Best Acted Film at the FIS Day in the Teachers Centre, Dunmanway held today. Rachel and Fíonn introduced our film to the audience. We had a most enjoyable day viewing all the other films. We were delighted to have representatives of Trend Micro visit our school today. Avril Ronan, James Maher and Mark Murray presented us with a cheque for €1,000 for winning the “What’s The Story 2017” primary competition this year. 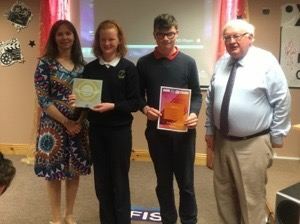 We were delighted to be announced as the winning primary school (8-12 years) in the ‘What’s Your Story’ movie competition for our video “Access Denied” which discussed what we would change about the internet, in particular issues relating to poor broadband, cyber safety and digital age of consent. This video can be viewed on our blog. 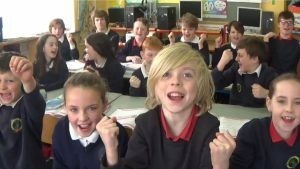 With a record number of entries this year to Trend Micro’s video competition, we were thrilled to be announced as category winners for Primary Schools in Ireland. We really appreciated the goody bags each child who participated received which included USB sticks, highlighters and biros. 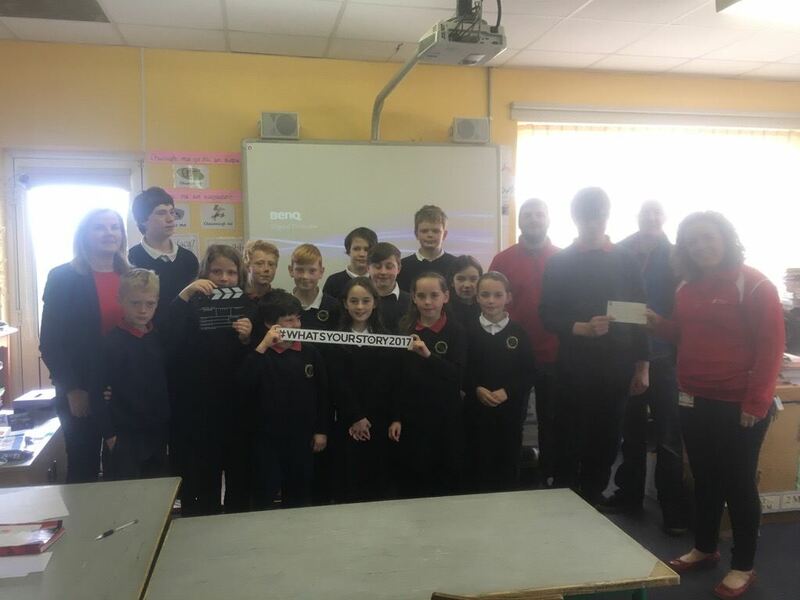 We were delighted to be announced as the winning primary school (8-12 years) in the ‘What’s Your Story’ movie competition for our video “Access Denied” which discussed what we would change about the internet, in particular issues relating to poor broadband, cyber safety and digital age of consent. Entries to this video competition to promote online safety, What’s Your Story, have overwhelmingly demonstrated that the Irish youth understand the need for balance in their digital lives. With a record number of entries this year to Trend Micro’s video competition, we were thrilled to be announced as category winners for Primary Schools in Ireland. Also judging the competition, Garry McHugh, Director of Young Irish Film Makers said, “The standard of film making was excellent across the board. The young film makers showed fantastic creativity, strong storytelling and a great sense of humour thrown in. I think we are looking at the next generation of content creators and film makers of Ireland. We hope you like our new video called ACCESS DENIED! Winning entries are selected based on a combination of ratings and number of views, as well as scores assigned by a subjective, independent panel of judges. So get the word out – share get as many people to view, rate, and comment on it – and increase our chances of winning! 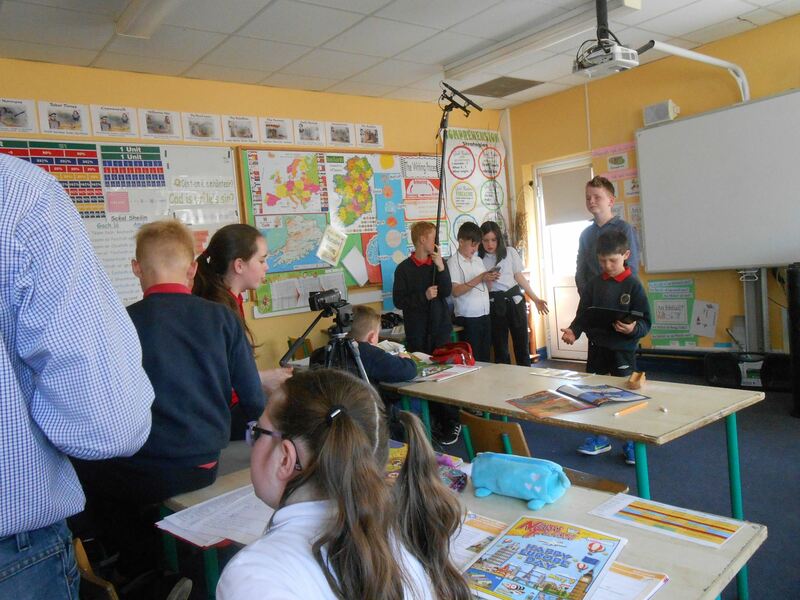 Our latest film as part of the Fís film project written and directed by the children of the school. Hope you enjoy!